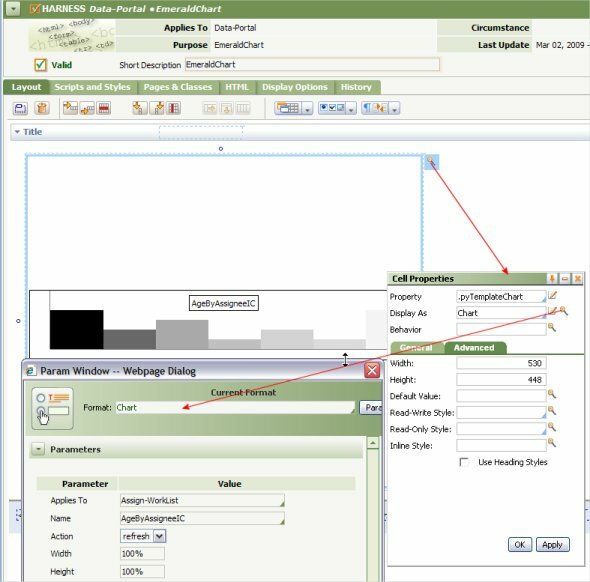 Using a Work Area control, a section in a composite portal can allow users to open multiple work objects at once. Through parameter settings, a Work Area control can provide a variety of other functional capabilities. 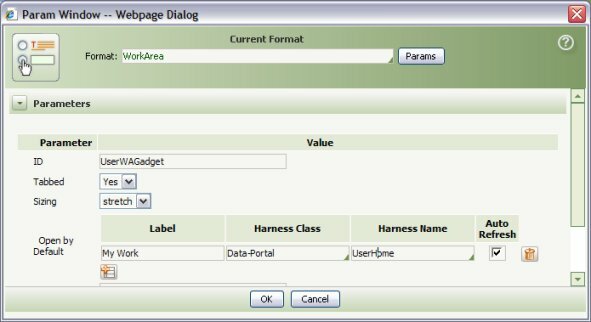 When building a composite portal for your application, if these settings meet your needs, you can directly reference the Data-Portal.UserCenterPanel section in a panel of a harness that occupies the Work space. 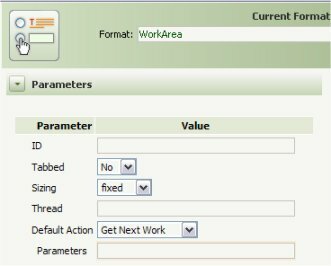 You can override the standard worklist report, to show different columns, add SmartInfo pop-up capabilities, or make other changes.. This requires no change to the HTML Property parameters or to the section rule. 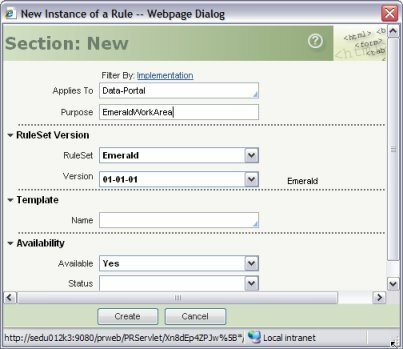 Using the Application Skin wizard ( Application > New > Skin ) you can change the fonts, colors, and formats of numerous portal elements and work object form elements. These also occur independently of the HTML Property parameters and the section rule. To explore other capabilities of the Work Area control, set the Tabbed parameter to No. Examples 2, 3 and 4 do not use tabs. Step 2: Add a Freeform layout below the initial (SmartLayout) layout consisting of a single cell. Delete the SmartLayout. Step 3: Open the Column Properties panel for this cell and clear the unlabelled check box to the right of the Width column. Similarly, open the Row Properties panel and clear the check box to the right of the Height column. Step 4: Select and drag the Work Area control ( ) from the Advanced group and drop it into the cell. Step 5: Open and complete the Cell Properties panel. Leave the placeholder property value .pyTemplateDocumentView ; it is not used. Complete other fields of the General tab and Advanced tab as desired. Set the width and height as desired; in other fields you can accept the default values. Step 6: Open and complete the HTML Property parameters. Click the magnifying glass icon to the right of the Display As field to access HTML Property parameters. These parameters determine the behavior of the control. Step 7: Set the Tabbed parameter to No. The parameter form changes to offer three possible values for the Default Action parameter. This parameter determines the contents of the Work Area upon initial display and refresh. where name1, name2 are parameter names and the values are literal constants within single quote characters, or a pagename followed by a period and a property name. Step 9: Include the section in a harness rule for a composite portal space. Step 11. 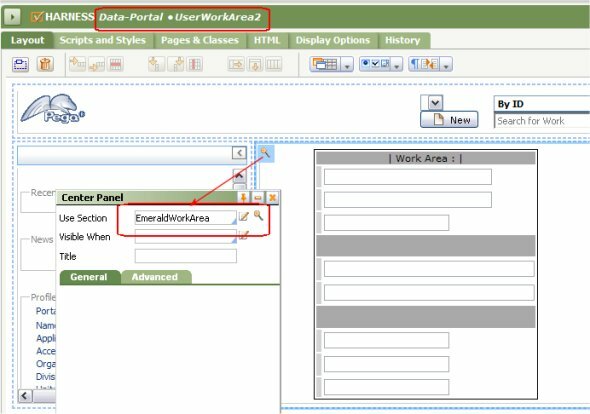 To test, sign on as a user (not a developer) who has an access group associated with the composite portal (UserWorkArea2 in this example). 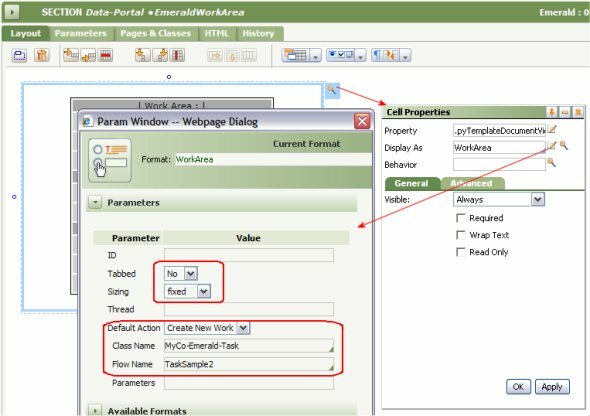 The Default Action parameter also allows Get Next Work as a value, which retrieves the most urgent and suitable assignment for this user by searching through a list of workbaskets. If this behavior is appropriate for users of your application as the initial portal display, complete steps as in Example 2 above, but selecting that parameter value. 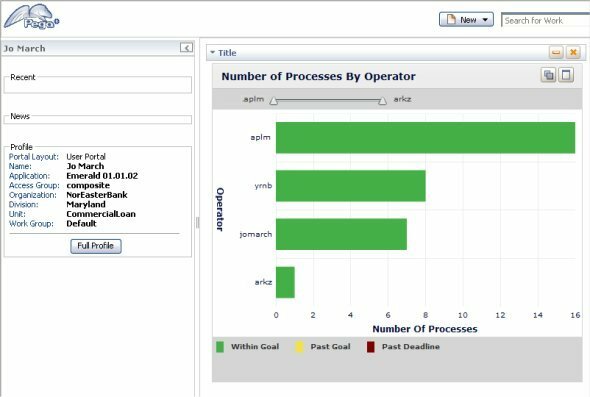 Each time a user associated with such a composite portal opens or refreshes the portal, Get Next Work processing locates and opens a carefully selected assignment, helping assuring productivity and throughput. A third Default Action parameter value is Display, which allows the portal to display a harness rule (that in turn may display any of a wide variety of objects). Complete steps as in Example 2 above, but select Display for the Default Action. Identify a harness rule. 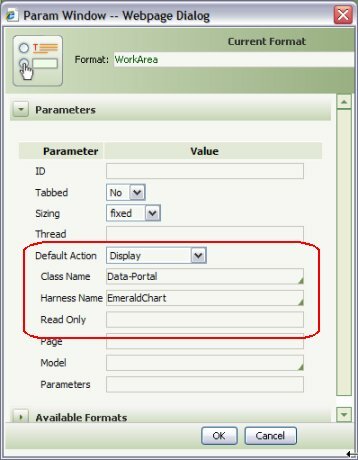 In this example, the harness rule is named Data-Portal.EmeraldChart. That harness rule in turn incorporates a single section that contains a Chart control.This example uses the interactive chart from the standard summary view rule Assign-Worklist.AgeByAssigneeIC.ALL . At runtime, users see a frequently refreshed display of assignments for everyone in their work group as a horizontal bar chart. Assignment bars are color-coded as to timeliness. At a glance, they can determine who has the most assignments and whether any assignments are at risk of exceeding service level agreements. By drilling down a chart bar and selecting an assignment to work on next, they can — as a team — work cooperatively to achieve within-goal processing. (This example demonstrates a capability of the Work Area control. Allowing work group members to pick assignments may not be appropriate for all organizations,).